When the Power LED on your Linksys gateway is blinking, this means that its firmware is corrupted. Launching a web browser and trying to access a website (i.e. Internet Explorer, Mozilla Firefox, Google Chrome or Safari). Performing a Ping test. For instructions on how to perform a Ping test, click here. After verifying that you have Internet connection, proceed with downloading and upgrading the firmware of the device. To do these go to Linksys Support Site to download the latest firmware of your gateway. For detailed instructions on how to do this, click here. If you’re unable to get online using the Linksys gateway, proceed with resetting the gateway and download and upgrade the firmware afterwards. If you’re using a Mac® computer, select the .bin file then click Choose. Once the message that says, "Upgrade is successful. Rebooting....." comes up, click . IMPORTANT: It is recommended to reset and power cycle the gateway after the upgrading process. NOTE: After resetting the gateway, power cycle the device by unplugging the power cord from the back of the gateway and after 30 seconds plug it back in. Connect one (1) end of an Ethernet cable to your computer and the other end to an Ethernet port at the back of the gateway. Launch a web browser and on the address bar enter the IP “192.168.1.1”, then hit [Enter]. 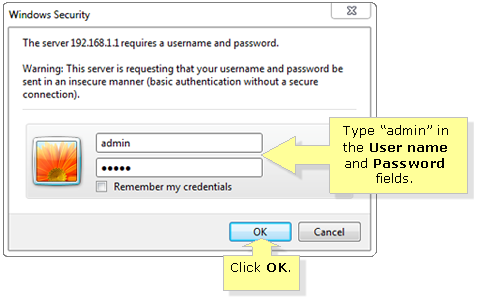 Once the login prompt appears, enter “admin” on both the Username and Password fields then click OK.
QUICK TIP: The Internet Connection Type (Encapsulation) may be different in certain areas depending on your Internet Service Provider. 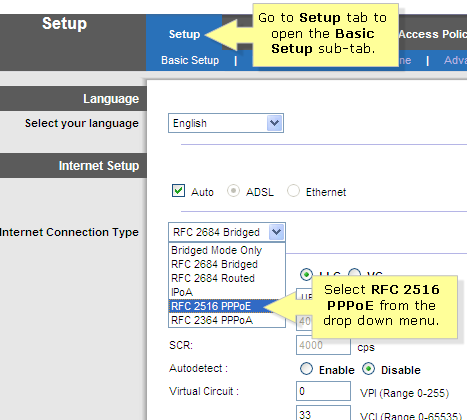 If the connection type that your ISP gave is not available in the drop-down, then this gateway is not compatible to work as a modem-router and can only be used as a router. NOTE: The username and the password can be obtained from your ISP.